Giving Tuesday is the unofficial start of the holiday giving season. Falling on the first Tuesday after the American Thanksgiving, it is a day that tries to turn the spotlight away from the glut of consumerism and on to the importance of charity. In past years, Nature Conservancy of Canada (NCC) donors, including Kerry and AJ Mueller, have stepped forward, offering to match donations to NCC’s work in Ontario made on Giving Tuesday. NCC communications manger Nicole Senyi sat down with the Muellers to talk about why they give to NCC and why the decided to participate in Giving Tuesday again this year. Nicole: Tell me a bit about how you first got involved with the Nature Conservancy of Canada. Kerry: When we retired we looked around a bit more than we had before for meaningful ways to give back and started to check out charities and found the Nature Conservancy of Canada. We always loved being out in nature and really supported NCC’s mission of conservation. AJ: I am an immigrant from Germany. I came to Canada in 1971 with my parents and what I have always appreciated about Canada is the wilderness, the wild open spaces, and the many untouched lands and forests. Your mission makes a lot of sense to me, and I wanted to participate in preserving the wilderness we have left. Nicole: Why did you decide to take part in Giving Tuesday? Kerry: We wanted to support your mission in a significant way and AJ suggested a matching program. We wanted to help other people see their money have more impact, engage more people and get them thinking about contributing. Even if people cannot give a large sum, a lot of people giving a little can add up to great things! AJ: A matching program sort of encourages other people to give, so I hoped that having a matching condition would get more people to jump on board. Nicole: What would you say to people who are considering giving to NCC? Kerry: I would say it’s one way to have a really big impact that will last a long time. Our country is one of only five in the world that has the majority of what is left of the planet’s wilderness. What we have in Canada is very precious. So it is important that we protect it now so that the species who are here today can continue to exist. AJ: Well, I think that one of the things with NCC is we trust that what you’re doing is actually for the long term — that the lands that are being preserved are for the long term. I think that is probably the key reason to support NCC. Kerry: We like how NCC maintains the land. NCC doesn’t just buy the land and let it sit, but looks after it. 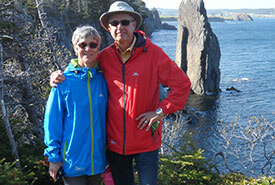 The stewardship aspect is a really good way to preserve those special places in Canada. AJ: We like how NCC is trying to connect land together to create corridors. We feel that you’re on the right track and want to support it as much as we can. Kerry: And the fact that the places you protect are accessible is important. Recently we enjoyed canoeing through the Minesing Wetlands. Years ago we really enjoyed taking our kids to Algonquin Park and seeing a moose with her calf, a beaver and loons. It is something that we wish all generations would be able to have access to, and unless we preserve these wilderness lands, there’s a good chance we won’t. This Giving Tuesday, the Muellers will be joined by Nature’s Aid and Copernicus Educational Products in matching donations for NCC’s work in Ontario, up to $80,000. For more information or to donate, visit natureconservancy.ca/donate.